La Frontera, el viaje con papá—My Journey with Papa is a powerful and compelling narration of a father and his young son’s difficult journey, and it’s also the story of the many thousands who are forced for many different reasons and in many different ways to leave their homes and relocate to the US. Alfredito thinks about all the people and things he will miss: his home, his family, his friends, and his beloved donkey, Fernando, who was born in the same year. He can’t even imagine leaving his mother; indeed, he’d prefer being hungry to changing his life. After his papá purchases the services of a coyote (in US dollars, of course) to assist them across the border, and after a huge going-away celebration with all the villagers, Alfredito’s sorrowful mother reminds him to be strong and that she will always love him. What she doesn’t tell him is that they will not see each other for many years. Father and son’s harrowing journey includes floating across the Río Bravo / Río Grande on an old inner tube, only to find that the coyote has disappeared—and taken all of Papá’s money with him. (This is not an unusual occurrence.) Alone, the two walk for five days, through a desert, over a mountain, and across a valley—stopping only to take a quick nap on the top of a train that had stopped and to grab a jug of water left for the migrants by a train crew. Finally they get to a place known as the “Embassy” where others are resting—a metal-and-plywood shack, a few broken-down trailers and an old well. A few weeks later, Alfredito is able to begin school. Here, he meets another Spanish-speaker and learns to navigate his new environs, while watching out for men in uniforms. Things are changing for the better and, four years later, after President Ronald Reagan grants amnesty to millions of undocumented immigrants, Alfredito and Papá travel to El Paso, where they reunite with the rest of their family. Alfredo Alva’s journey began some 30 years ago—before the current US administration that demonizes immigrants, migrants, refugees and asylum seekers, and before the current US administration that breaks up families and imprisons terrified youngsters. For immigrants such as Alfredito and his Papá, stealthily crossing the border to find work so that their families can survive is a desperate and heroic act. One of the things that makes La Frontera, el viaje con papá—My Journey with Papa special is that it’s a true story of a hazardous journey, written at a level that will appeal to younger readers and listeners—both hablantes and English-speakers alike. Most of the stylized art consists of full-bleed double-page spreads, with the text superimposed on or complementing the sky, the grass, or the adobe walls in the illustrations. Throughout the story, Alfredito wears blue pants, red sneakers and a blue-green shirt with yellow stripes; Papá wears dark blue pants and a light blue shirt, Mamá almost always wears a red dress with embroidered trim, and Abuelo wears un vestido de paisano con huaraches, typically worn by gente de campo. That most of the characters wear a “signature outfit” provides a cue for younger readers who otherwise might have difficulty in differentiating some of them. Although all of the art is appealing, one illustration in particular stands out. At Alfredito’s and Papá’s going-away celebration (for which Uncle Tomás had announced that he would roast the family pig), bright lights and papel picado are strung between trees. The table is loaded with food, and it appears that the whole town has shown up. Yes, the family is hungry and must be split apart. But for now, as the multigenerational, multiethnic Mexican family, friends and community—desde el más viejo hasta el más joven—gather for what may be their last party together, there is dancing and laughter and flirting and love y abrazos y besos. And as they sing their favorite song, “Amor eterno,” there is joy. Younger readers may discover here that, while an individual family may be hungry, in this moment, together, in community, they are all wealthy. The back matter contains black-and-white family photos (one of which shows Alfredo Alva and his large, smiling, extended family in Texas in 2016) and presents notes in Spanish and English that extend Alva’s narrative: a short history of his journey to Texas in the 1980s, a brief illustrated discussion of the changing frontier between Mexico and the US, and a short “objective” explanation of the hows and whys of immigration. 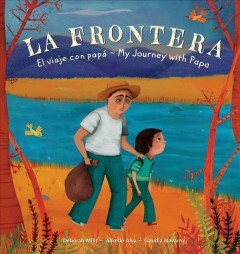 Story, art, translation and design beautifully come together in La Frontera, el viaje con papá—My Journey with Papa. For younger readers and listeners—and everyone else—it’s highly recommended. Gracias a mis colegas, Oralia Garza de Cortés and Lyn Miller-Lachmann. 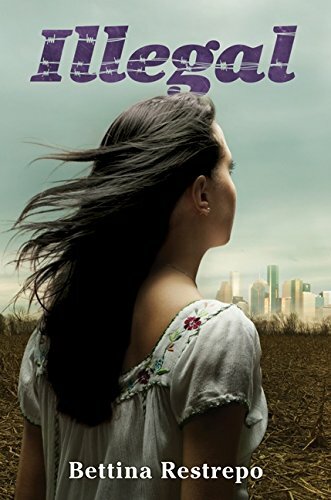 (1) Although Alfredo Alva worked with his neighbor, author Deborah Mills, to write this story, La Frontera is essentially his narrative, his story—and, rather than presenting Mills’ name first on the cover and title page, the publisher should have placed Alfredo Alva’s name in the primary position. (2) Creating an authentic bilingual children’s book requires the equal participation of author, illustrator, and translator. In La Frontera, the publisher failed to include the translator as a legitimate member of the team by listing her name only on the CIP page, in tiny type. I hope that these two errors will be corrected in the next printing. 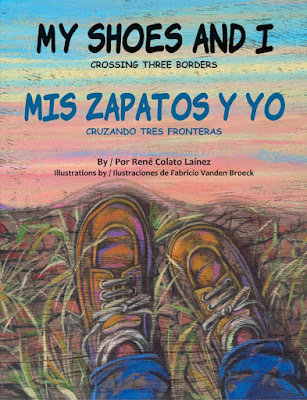 My Shoes and I: Crossing Three Frontiers / Mis Zapatos y Yo: Cruzando Tres Fronteras was originally published in English by Boyds Mills Press in 2010. 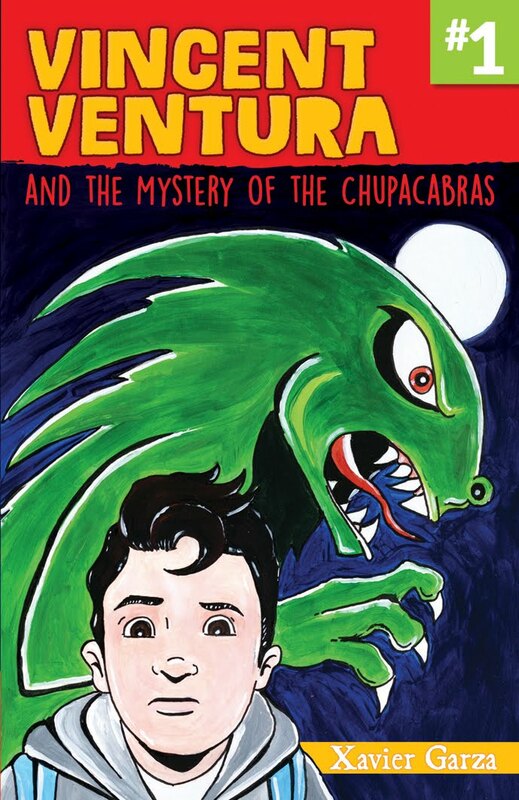 With English text modified and simplified, and Spanish added for this edition, the story is based on Colato Laínez’ own arduous 1,000-mile journey, traveling with his father from El Salvador through Guatemala and Mexico to the US. Together, the boy and his father walk across valleys, climb up mountains, take a two-day bus ride to Mexico City; sleep in an old, dark trailer for a few days—and, finally, swim across the Rio Grande and walk to the border—to reunite with Mamá, who is waiting for them on the other side. 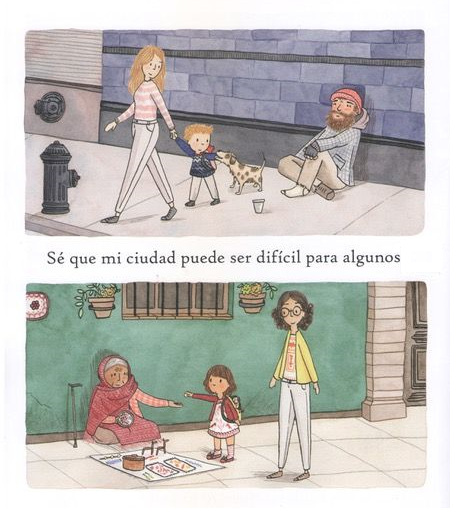 In contrast to the author’s actual situation, the family here are immigrants rather than refugees. This is an important distinction. In the 1980s, thousands of Salvadorans fled here to escape the 12 years of violence in which right-wing government forces, supported by the US, murdered more than 75,000 civilians. Although times were dangerous then and they remain so today, both story and illustrations erase the horrors and the historical differences between the author’s experiences in the 1980s and those of Central American refugees today. For instance, refugees from Central America are desperately fleeing organized gang violence; whole families often travel in caravans for safety. And, of course, the political climate on the US side is terrifying as well. Vanden Broeck’s bright, heavily saturated paintings on weathered wood-grain backgrounds center the shoes from varying angles. In some scenes, the illustrations belie the text. In the next-to-last spread, for example, René’s shoes are in the water, and he is looking directly at both of them. But the text reads, “I see a shoelace. I grab it. A shoe comes out of the water. I don’t see the other one. I come out of the water. Papá and I look around. 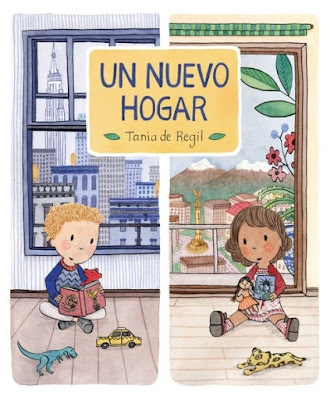 Trapped in some branches is my other shoe.” And in the last spread, René and Papá reunite with Mamá at the shore—and they appear completely clean and dry. It’s possible that whatever text was revised in this newer version of the story did not follow the art, or vice versa. As a story of an immigrant or refugee family reuniting in the US, the story leaves a lot of questions: If Papá and young René are undocumented (as he writes in his author’s note), how is it they are traveling alone? If they are documented, why are they mostly on foot rather than taking available transportation? What’s the status of Mamá, who is already on the other side? My Shoes and I: Crossing Three Borders / Mis Zapatos y Yo: Cruzando Tres Fronteras oversimplifies the horrors that refugees from Central America face as they pass from El Salvador all the way to the US. It’s a pretty safe book for younger readers who don’t have the family experience of being refugees and, as such, it’s recommended. If used in the classroom or library, I’d strongly recommend My Shoes and I: Crossing Three Borders / Mis Zapatos y Yo: Cruzando Tres Fronteras be read in conjunction with Jairo Buitrago’s and Rafael Yockteng’s excellent Dos Conejos Blancos // Two White Rabbits (Groundwood, 2016).